For The Love Of Football: Chelsea, Chelsea, Chelsea! The Irishman left Jakarta late on Thursday evening to catch an 8.5 hour red eye flight to Dubai. At Dubai he had to hang around for 4 hours before catching the connecting 5 hour flight that would get him to Munich. In total a journey time of over 17 hours, not including the 1 hour taxi ride to airport in Jakarta or the 2 changes of train, plus taxi ride he took which eventually go him to his hotel on the outskirts of Munich yesterday evening Indo time, early afternoon German time. The reason he’s taken this trip is because he is a life long fan and supporter of Chelsea FC and today they are playing against Bayern Munich at their sensational homeground stadium, Allianz Arena, in the European Champions League Final. Irishman’s biggest luxury in life is his Chelsea season ticket which he renews every year without fail but since moving to Indonesia last year, has now lent to a friend in London. The Irishman misses his home games at Stamford Bridge so much, and the comaraderie, man hugs and banter when meeting up with his Chelsea mates, the sharing of the highs and lows of the season as it progresses, so it was an absolute no-brainer to me that he should jump at the chance of going to watch the game in Munich tonight after Chelsea beat Barcelona in the semi-finals 3 weeks ago. 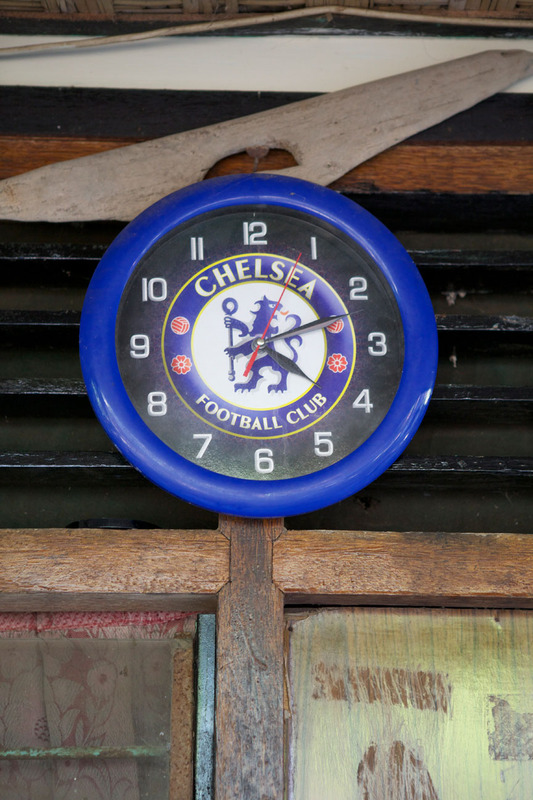 Chelsea clock in Wayans house in Bali. The fact that he’s only going to be there for 48hrs, will be spending 34 plus hours on planes, trains and automobiles, burning a huge hole in his wallet and, will no doubt be suffering severe jet lag when he gets back to work next Monday doesn’t matter in the least. When you love football, and you love your team, nothing gets between you and an important game like this. So, last night after he finally arrived at his hotel and managed to skype me to say that he had arrived safely and all was well, it got me thinking about why this longhaul trip that he’s made is so special, and why it was important to us both that he could make it. If you’ve never lived with or loved someone that is passionate about football, then you will never have experienced the abject misery when their team lose, nor the sheer elation and euphoria when they win. It is magic. No matter your class, creed, or colour, football is a universal language that is understood by all who love it – it breaks down all socio-economic/religious/racial barriers, it is the sticky tape that glues mankind together. Think back to that famous moment in history when in the bitter WW1 trenches on Christmas day there was a truce, and the Germans and English stopped their fighting, and played football instead. Of course we want Chelsea to win — it’s England playing Germany, it’s a big deal, a sense of national pride and all that. Whatever the outcome this evening, the fact that so many people have travelled from all over the globe to support their teams speaks volumes to me. It’s not just about the glory of winning, or the shared despair if they lose, it’s about being a supporter through thick and thin. It’s the friends that you make along the way, the spontaneous conversations struck up with strangers when you discover they support the same team as you wherever you are in the world. It’s that feeling of being part of a tribe, be it the street kid in Jakarta wearing his Chelsea shirt who you give the thumbs up to when you pass him and who then smiles and laughs back when he notices your Chelsea t-shirt, or the waiter in a hotel in Nairobi who although wearing a starchy white uniform, still manages to discretely pin a tiny Chelsea badge onto his jacket, small enough not to be noticed by the management, but visible enough to be seen by anyone who shares his love for the same club. For all the bad press and ugliness that we occasionally hear about football hooligansim and fighting, I would argue that the amount of good and happiness that comes to so many people far outweighs the bad. I doubt there are many boys who didn’t at sometime dream of becoming a famous footballer and then had to suffer the devastation and crushing blow that comes when they realise that they are not destined to follow in the steps of their heroes. However, for those lucky enough to make the grade, whatever their background, be it a shanty town in Africa, a slum in Brazil, or a middle class boy from the West, it doesn’t matter because in football especially, there are no boundaries, there is only skill, and today’s top players, whatever team they play for, can rest safe in the knowledge that someone, somewhere, some day, will be be prepared to move heaven and earth to travel to watch them play. So for all the boys that never made the grade, (but never let it stop them loving football), and for those few lucky ones that did, and for all the men and women that are joined in their love of football the world over, enjoy the game tonight wherever you may be. C’mon Chelsea…C’mon Chelsea! For the love of football, I guess you’ll do anything. I’m glad he got to go even though it seems like a whole lotta drama to do so. I’m glad he’s got to go too! I’m now puzzling how to watch the match myself. It’s now midnight in Bali and I’m not sure if it will even be on tv when the game starts at 2.45am Indo time. I hope it is, because I’d love to see it, nail biting though it will be! I’ve got to hand it to you…you make football sound almost palatable! AND WIN THEY DID!! and it’s now 7.45am in Bali and I’m still celebrating! Really enjoyed reading this post, Lottie. And it’s so awesome that Chelsea won! Yippie! Absolutely love the photo. “No matter your class, creed, or colour, football is a universal language that is understood by all who love it – it breaks down all socio-economic/religious/racial barriers, it is the sticky tape that glues mankind together.” Great line and I couldn’t agree more. This is what’s wonderful about sports. If only we could solve all disputes through sports and stop warring with each other, how amazing the world could be. It’s a vision worth believing in. Thank you so much for your comment IK. Football does so much for the world in a very positive way. You are spot on when you say that it could solve all the disputes, and stop all the warring with each other. That’s Pete’s sentiment too.